"The greatest treason is not treason against governments but against human beings. Treason against the people is committed in many diverse ways. Oppression through violence, terror and inquisition; the exploitation, despoilment and impoverishment of millions of men and women; despotic laws and the use of the courts as instruments of repression; fraudulent propaganda a7id the artificial pitting of one section of the public against another; the malting of wars and the monstrous alchemy of converting mans blood into gold: all these are forms of treason against the people. And common to all of them is the fierce determination of a privileged minority to retain their power and increase their advantages at the expense and suffering of the great majority. Conjuring Hitler: How Britain and America Made the Third Reich, 2005 / Free Pdf. "Howard Ambruster, an American chemical engineer who had studied the close relations between the German chemical trust and certain American corporations. warned (in 1947! ): "Farben is no mere industrial enterprise conducted by Germans for the extraction of profits at home and abroad. Rather, it is and must be recognized as a cabalistic organization which, through foreign subsidiaries and secret tie-ups, operates a far-flung and highly efficient espionage machine — the ultimate purpose being world conquest . . . and a world superstate directed by Farben". The critical knowledge collected here make a historiographic 'epistemological break' in showing that Western corporate power relations were behind WW1 and WW2 - and that the same corporate power relations have only gotten more powerful since WW2. The history books' general lack of underlining the corporate cause behind WWl And WWll make people blind to the dangerous reality today, where corporate powers have only gotten still more powerful: destroying nations that will not obey the Western corporate powers from Korea to Chile, Yugoslavia, Libya and now Syria, Russia, North Korea and China etc. Indeed, the very lack of understanding the corporate power control of Western 'foreign policy' is arguably the most important reason that the Western 'foreign policy systems' can continue its destructive 'New World Order' imperialism. In a still more powerful dangerous 'totalitarian' way, as Western politicians are becoming more aggressive in targeting critical information as 'fake news'. Given the nature of this development towards 'totalitarism' it is simply logical that Western politicians, academics and journalists never talk about the intel agencies such as the CIA/MI6 and the corporate power relations' responsibility for NATO's wars. Just as the Western public sphere is silent on the crucial facts about the corporate nature of Hitler's nazism and the corporate causes behind the two world wars. - WWII – a war that cost the lives of more than 60 million people – was planned and financed by the world’s largest chemical/ pharmaceutical cartel. At that time Germany’s IG Farben consisted of Bayer, BASF, Hoechst and others. - The driving force behind WWII was IG Farben’s ambition to achieve control of the global oil and drug markets and eliminate, by force, any competition. - The IG Farben companies financed the rise to power of the Nazi party and the transformation of German democracy into a dictatorship. "The Nuremberg Pharma Tribunal of 1947/48 records document that WWII was planned and prepared in Frankfurt, Germany, headquarters of IG Farben." "This story is about the rise of the I.G. Farben-Nazi empire, its fall in WWII, and then its return to power, thanks to the intervention of certain highly placed Americans. ", The Crime and Punishment of I.G. Farben,1978, by Joseph Borkin / Rev. Crime Punishm. "The United States and the Recruitment of “Bastards” - The story goes back to the founding after 1945 of the US national security complex for propaganda and political warfare to roll back communism in Eastern Europe and the USSR. This story is told in Christopher Simpson’s Blowback: America’s Recruitment of Nazis and Its Effect on the Cold War (1988). (..) [Also] Douglas Valentine’s The Phoenix Program about the CIA’s covert counter-insurgency operations in Vietnam (1968-72). Phoenix is listed by CounterPunch as one of the 100 Best Non-Fiction Books ever. Together, these two books say everything one needs to know about how the US government came to act in our time like a rogue state, riding roughshod over international law, arming and training reactionary terrorist groups, privatizing military operations, fomenting regime change through psychological warfare, spying on the whole planet, and acting generally as though the world would come to an end unless the US dominated it. Today’s ideologically absolutist/manichean foreign policy—“you’re either with the US or you’re with the terrorists”– is the continuation of the absolutism, which formed in the early post-war years: you’re either with us or you’re with the Reds. The recruitment of jihadists (as done originally in Afghanistan) in the 1970s and afterwards and now Neo-Nazis in Ukraine to undermine regimes reflects the practice by the intelligence services at the end of WW II of recruiting Nazis, most of them major war criminals. - Writing in the 1980s, Simpson suggests that this recruitment caused “blowback”—not in the sense of revenge as in Chalmers Johnson’s thesis in his later book by the same title. Simpson’s thesis is much more insightful. It suggests that the US/Nazi collaboration, among other things, damaged the prospects for world peace. In this respect, it is instructive to look at the case of Reinhard Gehlen, Hitler’s top military intelligence officer on the Eastern front. (..) Though he had promised not to hire agents from the now internationally criminalized SS, SD, and Gestapo for crimes against humanity, war crimes, and crimes against peace, he did just that, sure that his employers would turn a blind eye. According to Simpson, he hired, for example, “Obersturmfuhrer Hans Sommer (who had set seven Paris synagogues to the torch in October 1941); SS Standartenfuhrer Willi Krichbaum (senior Gestapo leader in southeastern Europe); and SS Sturmbannfuhrer Fritz Schmidt (Gestapo chief in Kiel, Germany). . . . During the first decade following the war, the US spent at least 250 million and employed 4,000 people full-time to resurrect Gehlen’s organization from the wreckage of the war”. "The Nuremburg trials were fixed. The US Justice Department did it. (..) For sixty years, the US Department of of Justice has remained the legal shield of the Arab-Nazi network, known as the Muslim Brotherhood. America is the only major nation still refusing to designate the Brotherhood as a terrorist group." From the book: "Dulles’ CIA Operation Paperclip assimilated Nazi scientists into the American establishment by obscuring their histories and preventing efforts to bring their true stories to light. The project was led by officers in the United States Army. Although the program officially ended in September 1947, those officers and others carried out a conspiracy until the mid-1950s that bypassed both law and presidential directive to keep Operation Paperclip going. Neither Presidents Truman nor Eisenhower were informed that their instructions were ignored. (...) “The Bilderberg group, founded by Prince Bernhard of the Netherlands, held its first meeting in 1954. The prince, a former officer in the SS, had worked in IG Farben’s notorious NW7 group, which served as spies for the Third Reich. Bernhard belonged to the Dutch branch of the Knights Templar. In 1954, he was appointed to govern the Dutch order. John Foster Dulles [Allen's brother] was one of the most helpful Americans in setting up the Bilderberg group. Incidentally, in 1954 Dulles testified in favor of a bill designed to return vested enemy assets, such as GAF, to their previous owners.” The Nazi Hydra in America: Suppressed History of a Century, 2012, Glen Yeadon // Pdf. "At a time when intelligence successes and failures are at the center of public discussion, this book provides an unprecedented inside look at how intelligence agencies function during war and peacetime. As the direct result of the 1998 Nazi War Crimes Disclosure Act, the volume draws upon many documents declassified under this law to reveal what U.S. intelligence agencies learned about Nazi crimes during World War II and about the nature of Nazi intelligence agencies' role in the Holocaust. It examines how some U.S. corporations found ways to profit from Nazi Germany's expropriation of the property of German Jews. The work also reveals startling new details on the Cold War connections between the U.S. government and Hitler's former officers." U.S. Intelligence and the Nazis, 2005, by Richard Breitman et al. "Written in 1944, thus contemporary to the events of the Second World War and Nazi Germany, The Nazis Go Underground describes how the Nazis planned and organised their descent into the underground as early as 1943. At this stage of the war, the situation for the Third Reich looked grim. With Bormann and Himmler as its architects, the Nazi party would go underground and prepare for World War III from the shattered ruins of Berlin. German generals were anxious to get the war over. They knew the war was futile, would end in total defeat and questioned Hitler’s suicidal military tactics. Survival as an institution, as a political force, for them, was essential. The Nazis concocted a system by which they would continue to have close contacts with members of the aboveground legitimate government after the end of the war. They would make sure to have some of their men, dependable ones, remaining in the official apparatus of the government, to be able to coordinate operations and policies. It was therefore believed that Nazi Germany could once more rise from the ashes after defeat in the Second World War. "Q: What about the Nazi angle? Are you saying radical Islam has Nazi roots? "The updated edition of Secret Affairs covers the momentous events of the past year in the Middle East. It reveals the unreported attempts by Britain to cultivate relations with the Muslim Brotherhood in Egypt after the fall of Mubarak, the military intervention on the side of Libyan rebel forces which include pro-al-Qaeda elements, and the ongoing reliance on the region's ultimate fundamentalist state, Saudi Arabia, to safeguard its interest in the Middle East. In this ground-breaking book, Mark Curtis reveals the covert history of British collusion with radical Islamic and terrorist groups. Secret Affairs shows how governments since the 1940s have connived with militant forces to control oil resources and overthrow governments. The story of how Britain has helped nurture the rise of global terrorism has never been told." “The Farben cartel dated from 1925, when organizing genius Hermann Schmitz (with Wall Street financial assistance) created the super-giant chemical enterprise out of six already giant German chemical companies – Badische Anilin, Bayer, Agfa, Hoechst, Weiler-ter-Meer and Griesheim-Elektron. There companies were merged to become I.G. Farben. Twenty years later the same Hermann Schmitz was put on trial at Nuremburg for war crimes committed by the I.G. cartel. Other I.G. Farben directors were placed on trial but the American affiliates of I.G. Farben and the American directors of I.G. itself were quietly forgotten; the truth was buried in the archives… Without the capital supplied by Wall Street, there would have been no I.G. Farben in the first place and almost certainly no Adolf Hitler and World War II. "In 1946-1947 the Finance Division of the Office of Military Government (OMGUS) recommended that Deutsche Bank and Dresdner Bank leaders be tried as war criminals and barred from ever holding positions of importance in German economic and political life. But these recommendations were never implemented, and officials from both banks went on to become key figures in German postwar development. Decades later, Christopher Simpson has uncovered the full story of the OMGUS reports, reproducing hundreds of pages gleaned from declassified reports and analyzing their significance in light of today's heated debates over the reemergence of these banks as financial giants, their role in the Holocaust, and how historical memory is to be defined." "I'm afraid i never heard of Starikov. While some of the things he writes are true, essentially the idea that appeasement purported to have Hitler attack the Soviet Union, some of his claims are definitely untrue, e.g. the idea that Hitler was brought to power by Britain and the US." "I just read part 4. It is basically correct that the "appeasers", i.e. Britain and France, wanted Hitler to attack the Soviet Union and helped him to acquire territory bordering on the SU, so a German attack would be feasible. It is true that Hitler disappointed them by not annexing Slovakia and allowing Hungary to take over the easternmost regions of the Czechoslovak state. If this caused London and Paris to turn against him, it was mostly because public opinion in Britain and France was outraged. Hitler did it because he liked the way appeasement had allowed him to make over big territorial gains and increase his prestige at home and abroad. His surprising move re Slovakia now allowed him to demand even more territory, namely Dantzig (Gdansk). But it is definteily not true that Britain and the US brought Hitler to power in 1933, even though the British and US elites sympathized with him. He came to power because of the support of the German elite, including industrialists, bankers, large landowners, the army, etc. - indeed, after losing, not winning, an election, in November 1932. 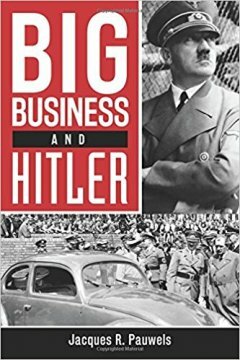 I describe all this in detail in my book Big Business and Hitler. • In the USSR power would change hands in favor of democracy, meaning a government that would accept responsibility for all the tsar’s debts, return nationalized industries to their Western owners, and allow oil to be pumped, diamonds to be mined, and Russian forests to be leveled – practically for free. We have provided only a tentative and cursory outline of this plan for future aggression. Since events played out quite differently in reality, no one ever spoke of how everything had been “planned.” The future victors of WWII – those who were directly responsible for organizing it – would in that event be cast in an unpleasant light. "The appeal [Stalin made to Hitler was clear and simple: if you are provoked to attack, we will be provoked to defend ourselves. And while we are embroiled in our fight, “they” will divide up our natural resources and once again bleed Germany dry. Is this what you need, Adolf Hitler? Is this why you founded your political party and set about dragging Germany from the abyss into which she was driven by the venal Weimar politicians? "Thus, it was not until midday on March 23 that Britain and France learned that Slovakia would not join the Third Reich. For nine (!) whole days, Hitler had carefully maintained the illusion that the Slovaks would be incorporated. Why did he deliberately cause this delay? Because he had decided to hold negotiations without his Western partners. (..) British and French political circles considered Hitler’s decision of March 15 to have been a fatal error – or so write the majority of historians and contemporaries. But none of them want to think about the true meaning hidden in this phrase. It is a paradox of history that when Adolf Hitler was fighting in Spain, harassing the Jews, and measuring the skulls of his own citizens, he was considered a respectable politician by the West. But as soon as he decided not to attack the Soviet Union and refused to appropriate the Carpathians, he was immediately seen as a “defiant aggressor. "And now let us take another look at the dates and events of that stormy March of 1939, in order to firmly establish that Hitler really was suddenly recast as an “aggressor,” not because he took over the defenseless country of Czechoslovakia, but because he did so in a manner completely at odds with what had been negotiated with the representatives of the West. March 14, 1939. Slovakia declares its independence and requests protection. Czech President Emil Hácha comes to Berlin of his own accord. March 15, 1939. President Hácha signs an agreement to incorporate the Czech lands into the Third Reich under the name of the Protectorate of Bohemia and Moravia, and thus preserves his position as head of the country. At 6:00 am, with no official announcement, Hungarian army units begin their occupation of Sub-Carpathian region. Big Business and Hitler, Nov, 2017, Lorimor: "Business was bad in the 1930s, and for multinational corporations Germany was a bright spot in a world suffering from the Great Depression. As Pauwels explains in this book, corporations were delighted with the profits that came from re-arming Germany, and then supplying both sides of the Second World War. (...) A key roadblock to America's late entry into the Second World War was behind-the-scenes pressure from US corporations seeking to protect their profitable business selling to both sides." "In the spirit of historians Howard Zinn, Gwynne Dyer, and Noam Chomsky, Jacques Pauwels focuses on the big picture. Like them, he seeks to find the real reasons for the actions of great powers and great leaders. Familiar Second World War figures from Hitler to Roosevelt and Joseph Stalin are portrayed in a new light in this book." The Great Class War 1914-1918, 2016, Lorimor: "In all countries socialists renounced the class struggle and proceeded instead to go to war for their fatherland and their people." - "war offered benefits to everyone, across class and national borders. "A People's History of the Second World War (2012) unearths the fascinating history of the war as fought 'from below'. Until now, the vast majority of historical accounts have focussed on the conflict between the Allied and Axis powers for imperialist mastery. Donny Gluckstein shows that in fact between 1939 and 1945 two distinct wars were fought – one ‘from above’ and one ‘from below’. Using examples from countries under the Nazi heel, in the colonies and within the Axis and Allied camps, Gluckstein brings to life the very different struggle of the people's and resistance movements which proliferated during the war. He shows how they fought not just fascism, but colonialism and empire, and were betrayed by the Allies at the war’s end.This book will fundamentally challenge our understanding of the Second World War – both about the people who fought it and the reasons for which it was fought." “The Peloponnesian war was, to a greater extent than Thucydides seems to have realized, a struggle between the business interests of Athens and Corinth for commercial supremacy in the West, all wars, Plato remarked, are made for the sake of getting money.